Well it's been awhile since I've done a TIME cover. D.W. Pine emailed asking if I was available over the Memorial Day weekend. No one phones anymore, and maybe D.W. needed someone who wasn't going anywhere for the weekend, Ha! He thought a very strong graphic, poster-type cover with a player and ball would be cool in my style. Very straight forward, and to the point. Fine with me, as I enjoy the opportunity to really explore a object in it's structure. 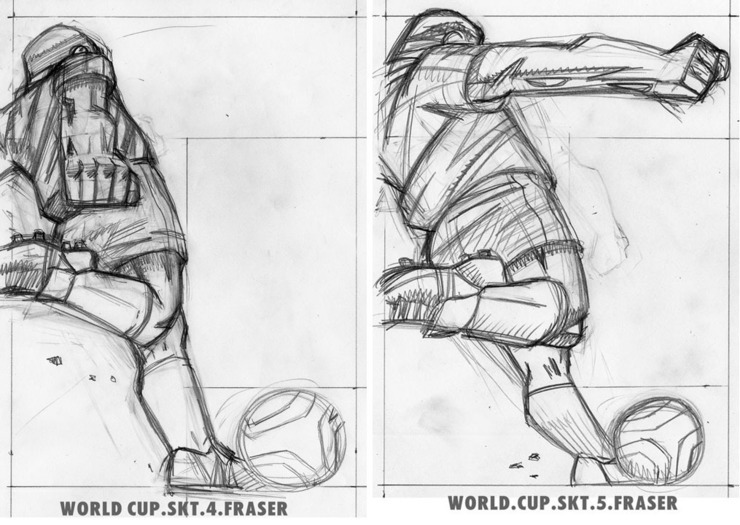 One of the bigger choices for me was whether to portray the traditional black & white soccer ball. I went with a more contemporary looking ball as it describes more appropriately the feeling to the event held in South Africa. As with any current cover work, there is the need for providing space for the necessary text, and masthead while maintaining the energy. Originally the text was to be on the left, but after an Editor review it was now on the right. 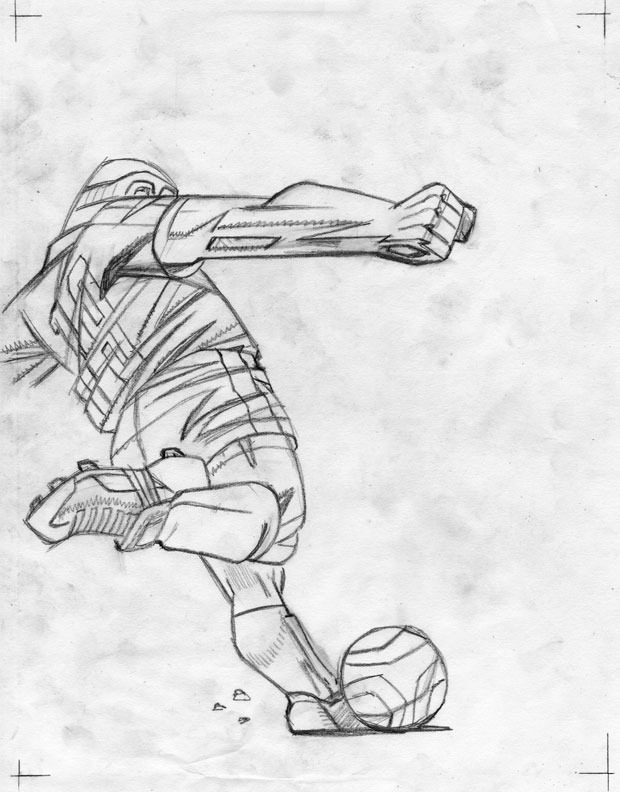 The Editor wanted a single player making a kick from the back, as I had done with another sports image of a baseball player. Not highlighting any one player was the goal. Killer cover Doug. Nice to see illustration two weeks in a row too. Funny, I just saw this on the news-stand this afternoon, and thought "That will be on Drawger tomorrow" Really iconic cover. Great stuff. This cover completely jumps off the shelf. well done! Powerhouse cover image. You knock 'em out of the park. Love it Doug, exceptionally bold and wonderful color to go with the strong graphic kick. The world cup is the finest tournament in the world of sports. This would have been a great poster for FIFA. Thanks Guys! I do appreciate it. The process was a good one with the help of Mr.Pine. Got this in the mail few days ago and was waiting for you to post it. A standout! and that foot is so solid. I saw it at the dentist this morning and it blew my mind. So solid yet full of motion. Please make prints! It's gratifying to read that others have seen it. I guess that's the buzz of working on published illustration. Leo, I'm hoping the dentist was kind. Big Congrats Doug, powerful cover! It was a joy to get this in the mail yesterday. Congrats Doug. yep, that was hard to miss. VERY nice. Powerful. Great choice by Time to go Fraser. Nice getting the cover and it's a good one. Fantastic cover. Interesting to see your choice between 4 & 5 - both would have been really strong, love the tension in 4 but 5 has more muscle. Also, nice choice using the modern ball pattern. A classic Fraser. SO beautiful! An absolute attention getter. Just wonderful. I love everything about this! Any of your sketches would have been great too. Your sketches feel so much like your finals, all of them are done with graphic/angular perfection. Fantastic! I work in the mail room at my job, I had to make color photocopy of the cover before I delivered the magazine to the person it belonged to. I was telling the guys who I work with that this is the work of my favorite artist. Love it Doug, give this guy a 10. This is great to see, especially since it's so much the exception these days. Maybe the occasional dynamic illustration that slips past today's focus group dictates will reopen eyes to how good magazine covers can be. Great work, Doug. Again, many thanks. 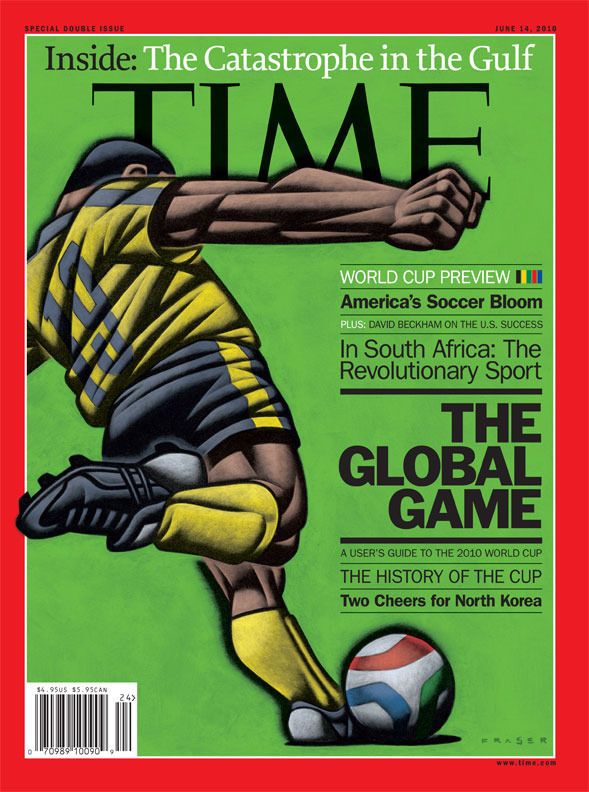 It's an opportunity I am quite appreciative of to work on the cover for a publisher that has the global reach of TIME. Great cover. The over the shoulder shot allows one to focus on power, not what the player's face is doing. Awesome. What Lin said. Fraser’s art, the perfect choice for this— it’s about TIME—cover. I just saw this in the check-out line today. Definitely an eye-catcher! Great cover Doug! I was in Calgary Internation Airport on the way to London and spotted it at the newstand....I said I know that Artist anywhere...beautiful job. Great one. Google should buy that soccer ball.